of their liberty or expelled socially. El sábado sabado 15 de noviembre de las 15h hasta las 18h30 se llevó a cabo la tarde de cine en el Centro Conviven. Contó con la participación de aproximadamente 30 personas: madres, adolecentes y sobre todo chicos y niños. Primero se mostró "Indiana Jones y la Calavera de Cristal", uno de los últimos estrenos del cine. Según los voluntarios a cargo también iba a marcar el el fin de la proyección. Pero por el entusiasmo de los niños lo reconsideraron. Con el permiso de los padres y trás una votación unívoca entre los chicos se proyectó la película de los "Simpson" no proyectada en primer lugar por no ser reciente y ya famosísima. Al final todos se fueron felices (pero cansados) a sus casas y se llevaron los recuerdos de una linda Tarde de cine en Conviven. For larger view click on the image! After arriving in Buenos Aires, with nothing but a few friends and a 3-month lease, I began a search for places to volunteer and came across Conviven. Though the one hour bus ride can be a bit tiring, the "trek" is awarded with a bustling center full of heart and energy. I began my volunteer experience by accompanying the center on their summer trips to pools and parks. Not only did I meet other volunteers from numerous international countries, but I also met children ranging in ages from 4-15 years. Their interests in my background sparked conversations about music and impromptu English lessons, as well as the opportunity for me to learn about them and their lives. I remember fondly a young girl from Peru who had also recently moved to Buenos Aires. We shared our stories and feelings of moving to a different city. With the start of the school year, I have been teaching English classes for the past few months, to the youngest class of students, ranging in age from 5 to 11 years old. With other volunteers helping out in the classroom, we have begun to teach these young and absorbent minds about fruits, animals, hobbies, transportation, and art. With almost no teaching experience, I have helped to feed their interests to learn English and witnessed young minds soar! 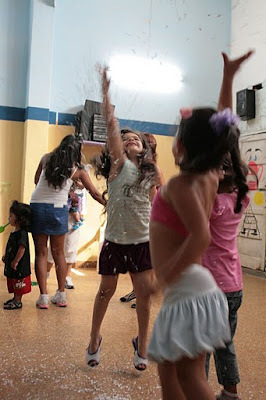 You have reached the weblog of Centro Conviven, a community centre in Buenos Aires that focuses on helping poor children from a shantytown called Ciudad Oculta (Hidden City). Over 50 kids visit Conviven every week to participate in different educational activities. A lot of those kids are regulars and come here almost every day. We are constantly looking for new volunteers who could have a good impact on Conviven-kids lives. 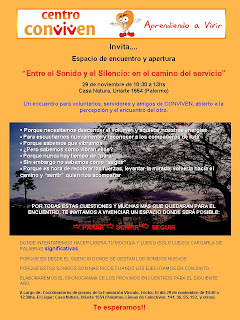 What could you do at Conviven? How to become our volunteer? What do previous volunteers think?